The Global Volcanism Program has no activity reports for Acotango. The Global Volcanism Program has no Weekly Reports available for Acotango. The Global Volcanism Program has no Bulletin Reports available for Acotango. Acotango, along with Volcán Humarata to the north and Cerro Capurata (also known as Cerro Elena Capurata) to the south, comprises the Nevados de Quimsachata volcano group. 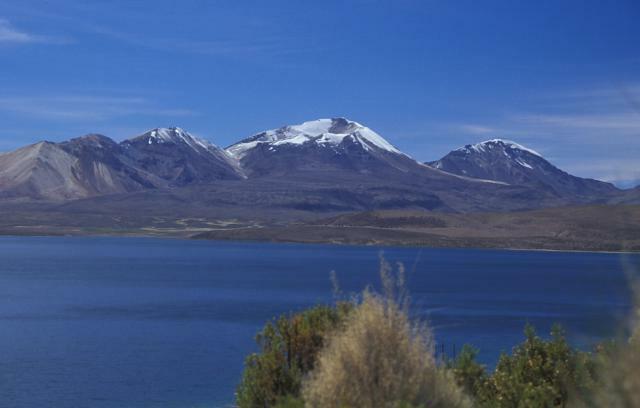 Quimsachata means "three" in the Andean Aymará language, and 5730-m-high Humarata, Acotango, and 5990-m-high Cerro Capurata straddle the Chile-Bolivia boundary along a roughly N-S line. The 6052-m-high Acotango stratovolcano is the central and highest of the three stratovolcanoes. It is in a fairly advanced stage of dissection, but a morphologically youthful lava flow on its northern flank suggested Holocene activity (de Silva and Francis, 1991). Later higher resolution imagery implied a Pleistocene age (de Silva 2007, pers. comm.). Humarata, with a summit crater breached to the ESE, and Capurata, a complex of lava domes and associated pyroclastic-flow deposits, may also have been active during the Holocene. Katsui Y, Gonzalez-Ferran O, 1968. Geologia del area neovolcanica de los Nevados de Payachata. Chile Univ Inst Geol Pub, 29: 1-161. The Global Volcanism Program is not aware of any Holocene eruptions from Acotango. If this volcano has had large eruptions (VEI >= 4) prior to 10,000 years ago, information might be found on the Acotango page in the LaMEVE (Large Magnitude Explosive Volcanic Eruptions) database, a part of the Volcano Global Risk Identification and Analysis Project (VOGRIPA). There is no Deformation History data available for Acotango. There is no Emissions History data available for Acotango. The Global Volcanism Program has no photographs available for Acotango. There are no samples for Acotango in the Smithsonian's NMNH Department of Mineral Sciences Rock and Ore collection. Large Eruptions of Acotango Information about large Quaternary eruptions (VEI >= 4) is cataloged in the Large Magnitude Explosive Volcanic Eruptions (LaMEVE) database of the Volcano Global Risk Identification and Analysis Project (VOGRIPA).